For about 15 years our professional team has developed a variety of software, which have been successfully applied to better manage and control the businesses of many clients. We usually create applications to fit each client’s exact needs. However, with the many years of experience, we do have a few applications that can be considered products, since they are general enough for anyone in a similar business to use. Each of our software product includes an analysis and design phase where we study our client's requirements to customize our program to meet exact needs. General Sales Management – enquiry, quotation, and orders. *Consignment Sales Management - department stores sales, credit note, etc. 4. Genesys BizPac. Finance and Accounts Software for SME's. General Sales Management – enquiry, quotation, and customer orders. Accounts Payable – purchases, returns, credit notes from supplier, payments to supplier, miscellaneous payments. Banking Management – print checks, deposits, post-dated checks, reconciliation, checks on hand, cash checks, etc. Full Accounting - account chart, GL, Trial Balance, Income Statement, Balance Sheet. 5. 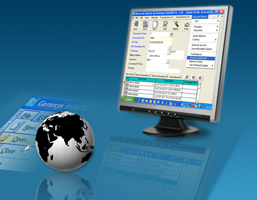 Genesys Pay I.T. Human Resource Management Software with Payroll. Pay Slip with Income, Deductions, Taxes. Export data for Bank Transfer for ATM for your bank. Can link to sales commission system, coupons for wages system, and finance system. Policies supported include fire, motor, marine, burglary, health, PA, life, construction, and miscellaneous policies. Genesys Infocad is committed to satisfy the needs of each client by providing a tailor-made solution for managing the client’s business functions. We provide three different kinds of development services, that you may choose as explained below. In the software development service, we provide a custom software for your exact business needs. Most businesses are different and do not fit a mold that software packages may force you to fit. We personally custom-fit you with the application that precisely meets your requirements. We begin with the Analysis & Design stage where we interact closely with you to gather all the necessary information. To make sure the product meets your needs, we have an extensive review process to confirm the design. Only then do we proceed with the software development phase. Many software companies do not bother with an extensive design phase, meaning the requirements are not well-captured. By focusing on design and by presenting the design in a manner that users can easily comprehend, the first release of our software product usually requires very little change. In addition, our client feels secure knowing they have had a good chance to review their needs prior to development or customization. For each stage of production, a formal weekly status report is prepared to inform our client of the status. Thus, our customers know the exact status and when to expect the completed software or requested changes. We also service companies seeking professional help for their own development team by providing software outsourcing service. Our involvement will be at the level agreed upon with each client. Once completed, the source code belongs to the client, thus making it easy for future modifications. Some clients even ask us only to perform analysis and design of the software for them, since they plan to develop via their own development team. As a company we have the strength both as analyst and as developer, which may not be the case with many other software development companies. We provide consulting services in any aspect of software development. We have been requested to assist in writing requirement specifications, designing interfaces, implementing a software package, validating a product, and project management. We can also help you draft a plan to improve the efficiency of your manufacturing processes through the effective use of information technology.